Saving your tooth and restoring it to its full strength and function is the main objective of root canal or endodontic treatment. Root canal treatment is a solution for an infection in a tooth that cannot be treated with antibiotics. Root canal treatment may be required as a result of decay, fracture or trauma; the problem can present as a toothache or as a silent chronic infection that is detectable only with x-rays. 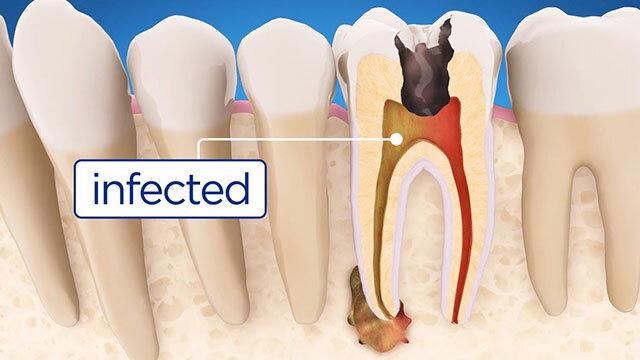 Root canal treatment addresses the biological problems of an infected tooth, however, it doesn’t address the structural problems that accompany them. As a result the tooth will generally require a structural solution to replace the missing components of the tooth, which in most cases is a porcelain crown. In most cases a complete root canal treatment is typically spread over three to four visits. The pulp is made up of soft tissue that includes nerves and blood vessels. If bacteria infect the pulp it will begin to die, after this, the bacteria can increase in number. The bacteria and the substances they release will eventually pass out the end of the root canal through the small hole where the blood vessels and nerves enter. This process continues as there is nothing to stop more bacteria passing down the root canal, which causes the tissues around the end of the tooth to become red and swollen. This can cause the tooth to become painful and, in extreme circumstances, your face may become swollen. Removing the bacteria from the root canal system (root canal treatment). During root canal treatment, once the bacteria are removed, the root canal is filled and the tooth is sealed with a filling or crown. In most cases the inflamed tissue at the end of the tooth will heel naturally. Root canal treatment should not be painful as local anaesthetic is administered for this procedure. It is important to look after your teeth when recovering from root canal treatment. You should avoid biting on hard foods until all treatment is complete. In most cases root canal treatment can be completed in 3-4 visits. Our team is here to help you. Please do not hesitate to ask any questions you may have about root canal treatments. Simply fill out our contact form and we’ll contact you quickly to book your consultation. Or, if you’d prefer to talk, please call us on (08) 9328 5027.